We moved our O'Neal location to our BRAND NEW FACILITY in March 2018. 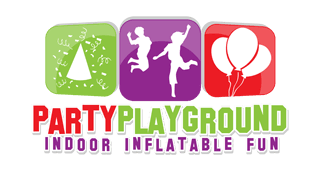 Party Playground is Baton Rouge’s premier indoor Family Entertainment Center. Party Playground originally opened its doors in March 2013. Come visit us for POP IN PLAY, BIRTHDAYS, FIELD TRIPS and more. Party Playground offers a safe, clean and cool indoor facility. We offer a broad menu of Private Party Packages, Semi Private Parties, Pop in Play, Weekly Specials, Lock Ins, Field Trips and more. We offer premiere service with our team of Party Pals who's goal is to provide a fun and memorable event for our guests. Host your next event at Party Playground. We do the work so you can have the incredible inflatable fun! Friday, Saturday and Sunday time slots fill up fast. To get the date and time you want, it is advisable to book your event 2 months in advance. However, we will always try to accommodate even the most immediate need with an available time slot. You can request a party reservation from our website or you can call us so we can help you choose the perfect party plan. We require a $75, non-refundable deposit at the time of booking to secure your event and time. This deposit is applied to the cost of your event. Will there be any staff to help supervise the kids in the play areas and party rooms? Yes, there will a Party Pals who will help you and your guests supervise safe play in the arenas, serve cake, food, beverages and clean up. Parents or adult guardians are responsible for the supervision of their children. All children at Party Playground must be supervised by a happy adult. What are parties like at Party Playground? When you arrive you will be greeted by our Party Pals. When guests arrive our Party Pals will give instructions on how to have maximum fun with maximum safety. Parents or guardians are required to complete a waiver for each visit. The waiver can be completed online or upon arrival for your event. You will enter the play arenas at your scheduled start time where the Bouncing Fun begins! After 80 minutes in the play arenas the children will put their shoes on and your private party will be escorted to the party room to enjoy any food and beverages you chose with your party package, all served by Party Playground Party Pals. It is not customary for gifts to be opened on site (if time permits during your party room time gifts may be opened on site). Gifts will be stored on a cart and our Party Pals will assist you with getting the gifts to your vehicle. At the conclusion of your event you will exit the party room and leave the cleanup to us. Can I bring my own food, beverages and decorations to my event? Our party packages are all inclusive. We do not allow outside beverages. Beverages for the children are included with our party packages. We also have other beverage options for your adult guests if you wish to add them to your package. Our beverage menu includes Coke products, juice, bottled water, Powerade and Capri Sun. No hot outside food may be brought in. You may bring one cold food item to supplement your package for your adult guests. If you wish, we can provide additional paper and plastic products at a nominal charge. You can add additional Pizza to any of our packages to accommodate these adult guests. Our party rooms are already decorated. If you are interested in a special theme for your party, you are welcome to bring themed products for your event. We do not permit hanging anything on the walls or from the ceiling. In order to keep our facility clean, we do not permit Silly String, Glitter or Confetti. Can I bring alcohol to Party Playground? Who is allowed to play on the equipment? The equipment is designed for children of various sizes and the equipment is for the safe play of the children only. Socks are required when playing on the inflatables and all children must be accompanied by an happy adult guardian and supervised by that happy adult guardian. When should we arrive for our party? You should arrive approximately 5-10 minutes before your scheduled party time. There will not be "setting up" before your event so arriving early is not necessary. We review our safety rules with everyone before the party starts. The guests will enter the play arenas at your scheduled party start time. How many children may participate in a party? Each of our Standard Party Plans are designed to accommodate a specific number of “child participants” along with your other invited guests. A limited number of additional participants can be added for an additional cost. Our Standard Party Plans are limited to 30 “child participants” and a total of 40 “attendees”. The “attendees” comprise the total “child participants” and the other “invited guests” that attend. There will be additional charges for an event that exceeds the stated limits of our Standard Party Plans. Our goal is for you, the children and your invited guests to have a safe and comfortable experience. If you wish to host a larger event or something other than one of our Standard Plans, Party Playground can offer you the use of both Arenas and both Party Rooms. We will work with you to design an affordable plan that will comfortably accommodate you, the participants and any adult guests that may attend.